In preparation for Thanksgiving, I made and froze Mr. Cleaver's holiday cherry pie this afternoon to be baked on Thursday. There's no recipe for the pie because I am a total cheater and use the cherries from a can. The crust however, is totally homemade, flakey, and delicious. You can find the recipe for that here. There is a bonus recipe at the bottom of this post, for those inclined. Mr. Cleaver loves pie. Particularly cherry. Last year, even though we had an apple pie in the freezer, Mr. Cleaver requested cherry. Since I love making pies, I obliged and we didn't eat the apple pie until the Superbowl, which made the Bears spectacular loss more bearable (pun? perhaps intended). This year, since I knew saving the second apple pie would be pointless, I ate it several weeks ago. In many ways, pie has been a central part of Mr. Cleaver and I's relationship. Like I said before, Mr. Cleaver loves pie and I love making it. It started, ever so circuitously, at Thanksgiving. I was living in Maine and had just started dating Mr. Cleaver a few weeks before. He invited me to accompany him to his parents for Thanksgiving, but I thought that was way too soon to be meeting the folks, so I opted to go with the rest of interns buddies to the Portland Stage annual Thanksgiving. 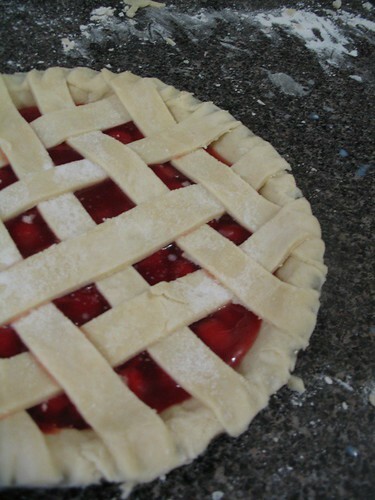 Hating to come empty-handed, I made a raspberry pie. But living in a furnished apartment meant I was missing several of my usual tools and, among other things, I ended up having to use an oddly shaped glass to roll out my crust. The pie turned out fine, but I wasn't looking forward to using a glass for the rest of the year. Mr. Cleaver doesn't get any of that pie, but he does finds out that I make them. Gears begin to spin. Flash forward a few weeks and Christmas is fast approaching. This time, still unable to travel to California for the Holidays, I have accepted Mr. Cleaver's invitation to join his family. Christmas is still several weeks away, but John has an early gift to give me. He prefaces the gift by saying that he's been carrying it around in his car for several weeks, and that he was afraid to give it to me, because he didn't want me to think that he had certain expectations, etc., etc. After much waffling, he gives me a rolling pin. I am thrilled, he is thrilled I'm thrilled. Everyone is thrilled except my roommate, who had also purchased me a rolling pin for Christmas. Christmastime and I'm off to Mr. Cleaver's folks, a perfectly-rolled out crust on another raspberry pie for his folks and even though we've only been dating two months, I want to make a good impression. I present his mother with my pie, only to find out they have about four other pies already purchased for about six people. This is a pie-loving family. Despite this excess of pie, his family is very kind and they eat the pie I brought and declare it tasty. I am relived, though slightly weirded-out by how Mr. Cleaver's brother-in-law keeps making references to how I'm going to be the next in-law. Let's just call it foreshadowing. Several months later, I'm at Mr. Cleaver's apartment and I find some cherry pie filling in his pantry. Just in case, you know, I was over and just really wanted to make a pie. I doubt my father came up with these, but he did have an awful good name for them. This is my favorite way of putting that extra pie dough to use. 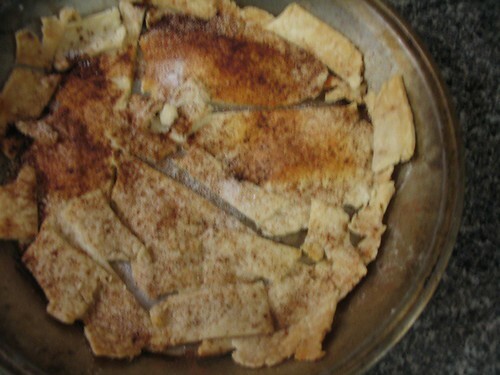 Ingredients: Leftover pie dough, Milk, Cinnamon, Nutmeg, and Sugar. Place small bits of leftover dough in a pie tin. Brush with a small amount of milk and sprinkle with cinnamon, nutmeg and sugar as desired. Cook for about 20 minutes or until brown on edges.Enjoy warm, but let cool enough so they don't become "cinnaminni-owies."